FEVER - ABSOLUTELY PRISTINE CONDITION - LIKE BRAND NEW! 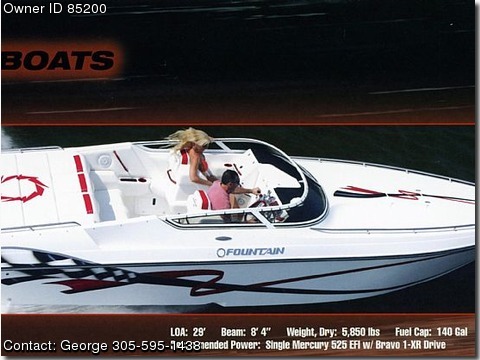 MECHANICAL FEATURES INCLUDE A HIGH OUTPUT MERCURY 525 EFI WITH ENCLOSED COOLING,REV LIMITER,FIRE DOG FIRE SUPRESSION SYSTEM,SS HEADERS/EXHAUST,SILENT CHOICE,XR/ITS DRIVE W/ 28P SS PROP,TRIM TABS W/ INDICATORS.COCKPIT FEATURES MONSTER GAFFRIG GUAGES,LIVORSI/BILLET CONTROLS AND HARDWARE,ELECTRIC BOLSTERS/HATCH,GPS,AM/FM/CD,SINK,HEAD,ELEGANT LIGHTING THROUGHOUT - LOADED W/ BEST OF AMENITIES.TRAILER IS A FACTORY CUSTOM FIT ROCKET ALUMINUM ANODIZED, WITH SURGE BRAKES.PACKAGE HAS 45 PAMPERED HRS. ,ADULT OWNED AND MANTAINED BY FOUNTAIN TECHNICIAN ALWAYS PRIOR TO RECOMENDED SERVICE DATE..I PAID $169,000. FOR ENTIRE PACKAGE IN 2007 AND WILL SUFFER A TREMENDOUS LOSS AT $99,000.